That Florence is still overwhelmingly full of artistic masterpieces we owe in greater part to the Medici family and, more specifically, we are all indebted to a woman of extraordinary culture and wit, driven by the love for her family and for her native city: Anna Maria Luisa de’ Medici (1667-1743). 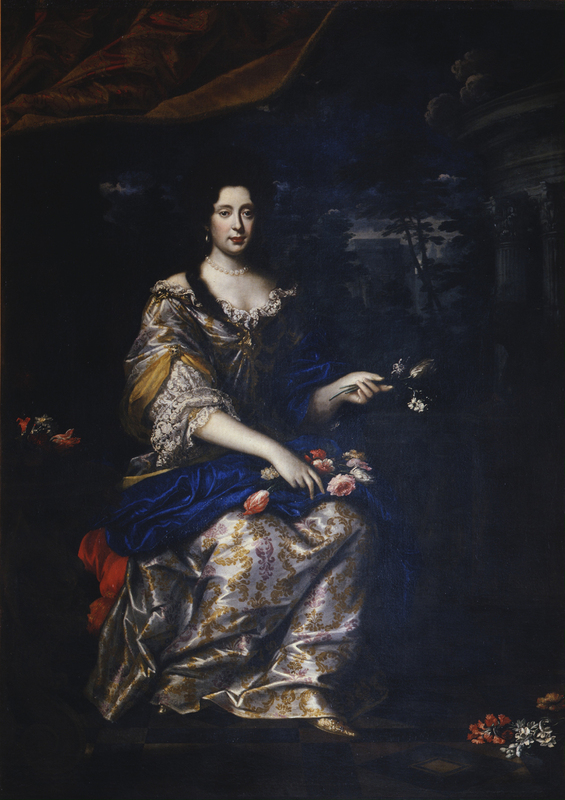 Daughter of Grad Duke Cosimo III and Marguérite-Louise d’Orléans, Anna Maria is frequently referred to as the Palatine Electress because of her marriage to Johann Wilhelm von der Pfalz-Neuburg, numbered among those who could elect the Emperor. Widowed with no children she came back to Florence to face the monumental task of taking care of the succession of the Medici, since her brothers also died without offspring. 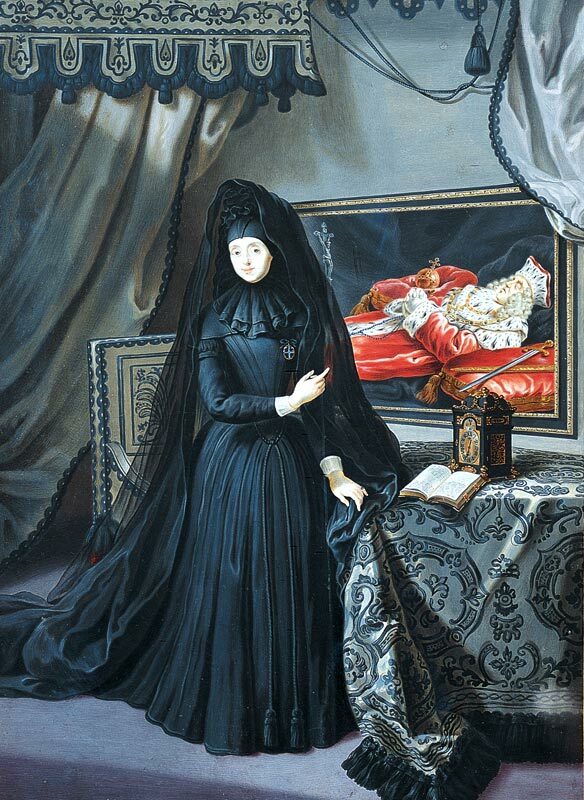 The conveyance of power and properties to the Habsburgs (as ratified by the treaty of Vienna in 1738) occupied the last years of her life and crowned her ambition to safeguard and protect the glory and memory of her family. At that time both law and custom held that the new dynasty would inherit among the properties the art collections, and the artworks could be indifferently moved, sold, exchanged according to the actual needs and wishes of the new owners. In order to prevent the dispersion of the family heritage Anna Maria decided to use a new weapon: Jurisprudence. She drew up the ‘Family pact’, bequeathed the possessions of the Medici to the new Grand Duke on the provision that they would stay forever in the city of Florence so they could “remain ornament of the state, for the use of the public and to attract the curiosity of foreigners”. 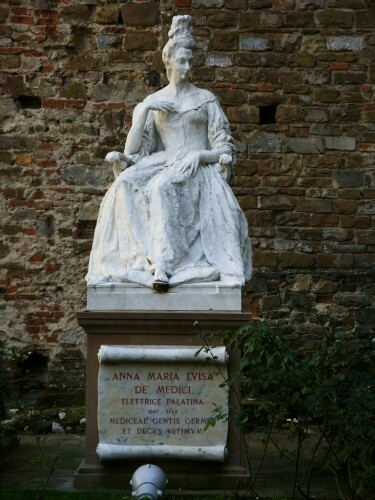 Anna Maria was selected to symbolize the rebirth of the Florence after WWII and a competition was held to realize a memorial stone. The statue by Raffaello Salimbeni was visible for a long time at the Medici Chapels, whose completion she heavily supported and that is now awaiting a new setting. In 1996 a big exhibition tracked her commissions and helped a further rediscovery of her work, inspiring new generations of historians (as you can read in the interesting Recipe project). Still today February 18th, the anniversary of her death, is a day of important celebrations and events: a pageant, free admission to museums and events to remember a woman so ahead of her time, both in her vision and in her teaching.